Material design is a design language developed by Google. The main characteristics of the material design are the ripple effect and the use of its z-axis. The interfaces are composed of multiple sheets of material that have the thickness of a single density-independent pixel. Below are some of the templates that are based on Bootstrap 4 following the Google material design guidelines. This list includes free and premium templates based on Bootstrap 3 and Bootstrap 4. The first one in the list is an admin template that is completely on the Material Design. 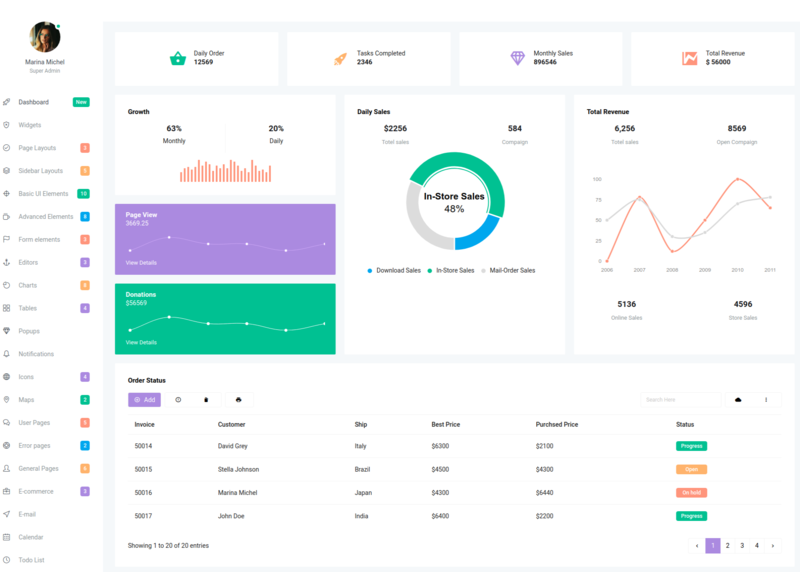 Unlike other admin templates in the list, Material admin template is not built using Bootstrap framework but is so well designed, that it is worth mentioning the template in this list. The template is built using the Material Design framework from Google, Material Components for the Web. 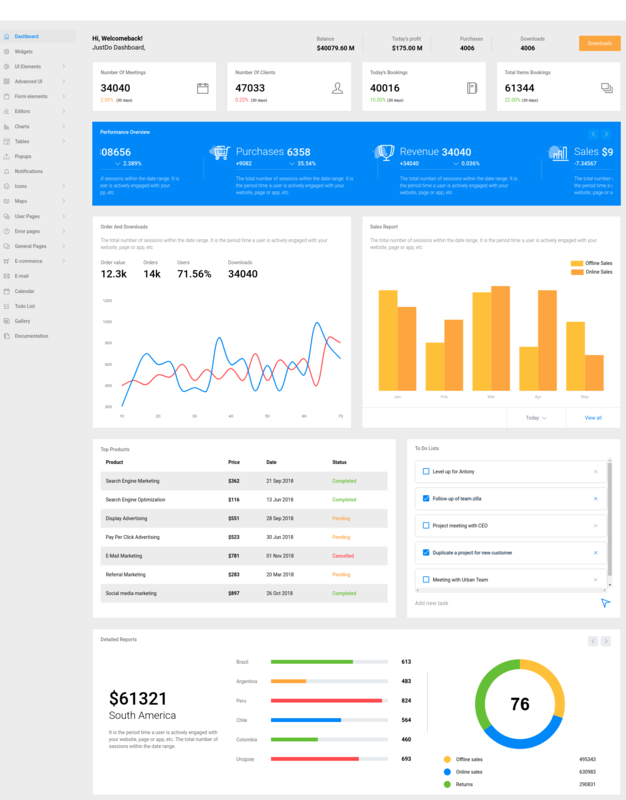 AdminBSB Material Design is free, responsive Bootstrap 3 admin template with material design, as the name suggests. It has a colorful, and flashy and well-crafted interface that catches the eye of the user. Some of the many features of AdminBSB are dashboard overview page, various widgets, image gallery, carousel, maps, form, advanced data tables, UI elements, example pages including Sign In and Sign Up pages, forms, change logs, and more. The collection of the UI elements is huge. For a free admin template, this template surpasses the expectation of the number of UI elements that you may expect. The form elements, tables, charts, makes it easy to create the design of your custom panel that with your own style inputs. The template supports all the latest and popular web browsers. A well-written documentation is provided for you to get started with your project with minimum issues. In case you have any issues you can post it to the GitHub page. Support is not provided but you can have a live chat with them that can help you clear any questions before downloading the template. There is no proper documentation as well. The template is compatible with most modern browsers including IE10+, Firefox, Chrome, Safari, and Edge. MaterialAdminLTE 2 admin template is based on Bootstrap version 3.3.6. Needless to say, the template uses material design. This template’s design is as good as a premium template’s. It is clean, simple, professional looking, very attractive and interactive. There are two dashboards in the template packed with a lot of widgets. There are many plugins included for charts, tables, forms, calendar etc. The template also has many prebuilt sample pages including invoice page, profile page, log in, register, pace page, and multiple error pages. The template also includes a well-designed email application page and calendar. The template has well-commented code that makes it easy to edit, delete, or move around the elements that you would need in your admin panel. This makes it very easy to customize the template. Minimum Admin has a very playful yet professional looking interface. The template has a clean very high-quality design, with very bright and eye-catchy colors. The components are arranged in a very organized manner that can help you decide if the template is the right choice for your design. The template uses interactive components and animations to make it stand out. Apart from the stand out design, the features and functionalities of the template are also remarkable. The template is filled with beautifully designed components. Starting from the two dashboards, The template has many features that can be sufficient for fa ully functional admin panel. 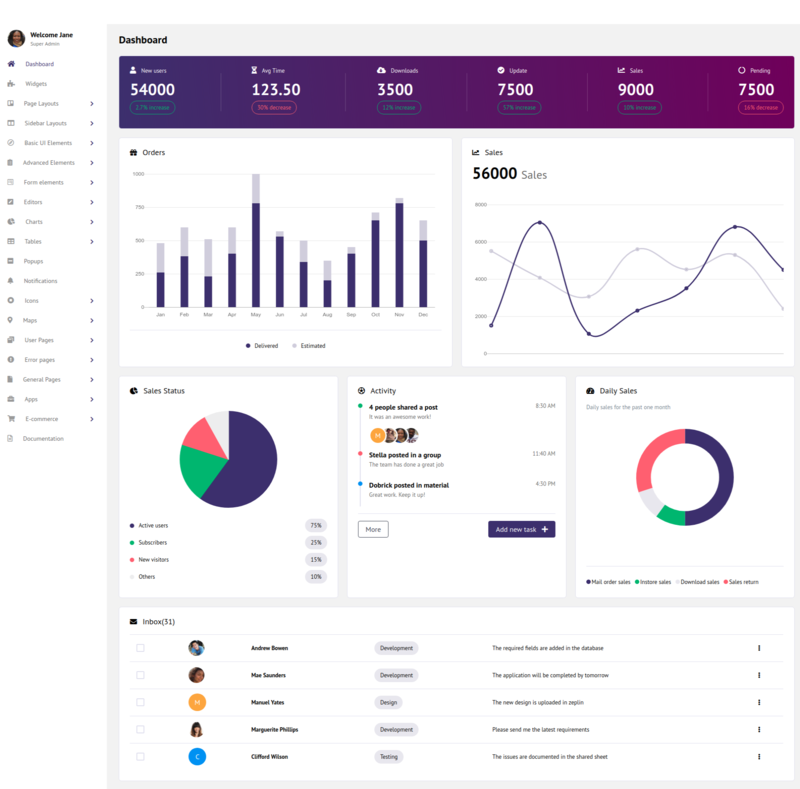 Material Pro Lite is a uniquely designed fully responsive free admin template based on Bootstrap 4. The intuitive, user-friendly, and professional looking design of the template uses different shades of the color blue that gives a sense of superiority to the design. The template also follows Google’s material design guidelines in the design. The template’s features include a basic data table, material icons, more than 10 UI components, Google map, 7 page templates including a profile page, a 404 error page etc. All these features of the template can be customized to create the dashboard of your design. Material Pro Lite is free only for personal use. For commercial purposes, you will need to purchase the license. The commercial version of the template comes with more features and functionalities. For the free version, there is no proper documentation or support, But you can get lifetime updates of the template. The template is cross-browser compatible and works perfectly well with IE10+, Firefox, Chrome, Safari, and Edge. 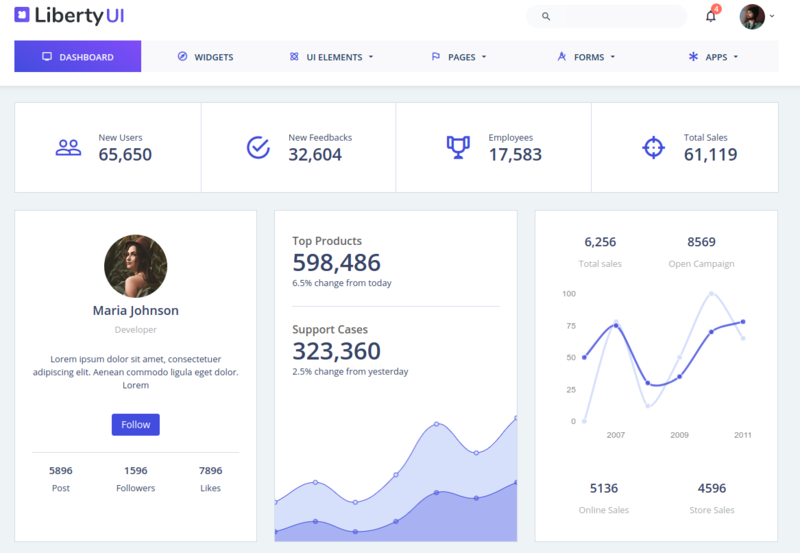 LibertyUI Admin is a full featured, multipurpose, premium bootstrap admin template built with Bootstrap 4 Framework, HTML5, CSS and JQuery. The template maintains a well-organized clean code meeting the standards, easy to customize, is fully responsive and mobile first. The template is frequently updated. Metronic is an ideal fit for large-scale web projects. It comprises of 1000+ of templates, more than 1500 UI components, more than a hundred widgets, and more. The template provides full support for SASS, Angular JS, Material design and RTL writing. It also includes many plugins for form elements, charts, UI elements, tables, portlets etc. In a nutshell, pretty much everything.Metronic is well-documented and provides great support through their support forum. The template costs $30 for a regular license. It has got an average rating of 4.89 based on 5271 ratings. 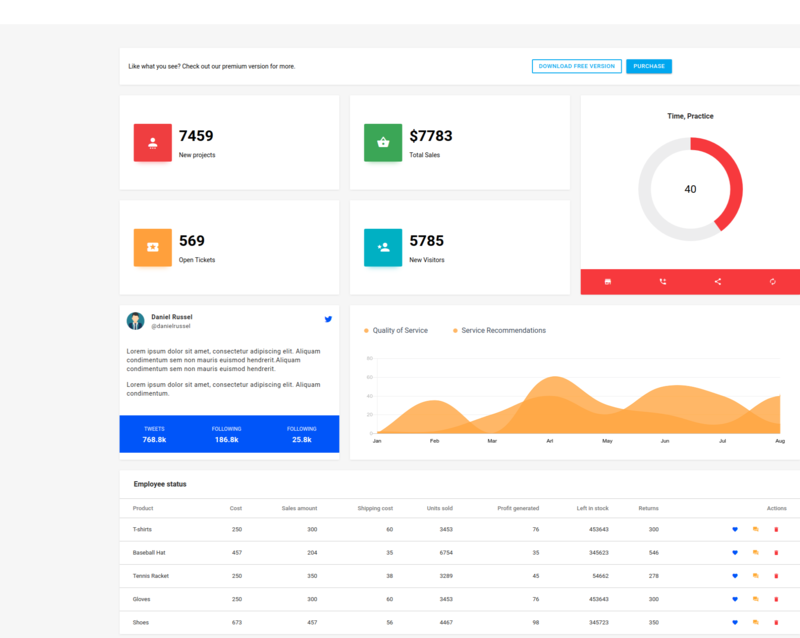 Remark – Responsive Bootstrap 4 Admin Template is an excellent pick to create a masterpiece admin dashboard. Beginning with the design, Remark offers two version for the design – classic and material. Other than that it has 6 different layouts for the menu, 6 page-content layouts, dark and light menubar and 11 predefined color schemes to choose from and you can always create your own custom color scheme to suit your tastes. 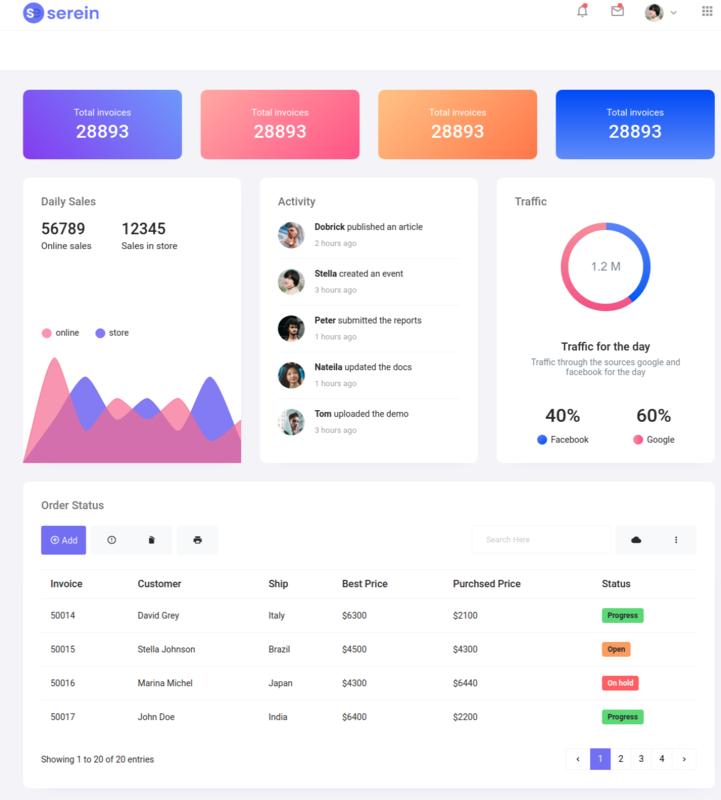 Coming to the functionalities, the template is fully responsive, it has 1000+ UI components- basic and advanced, 100+ widgets, charts, forms, tables and much more. There are 25+ pages that the template has, and the additional pages include 5 error pages, FAQ, gallery, gallery grid, maps, login and register pages, sitemap, code editor etc. Remark – Responsive Bootstrap 4 Admin Template is well documented, has an average star rating of 4.77/5 in Themeforest. The template can be purchased from Themeforest at a cost of $24 for the regular license. Support for the template is provided by amazing Surge via email. 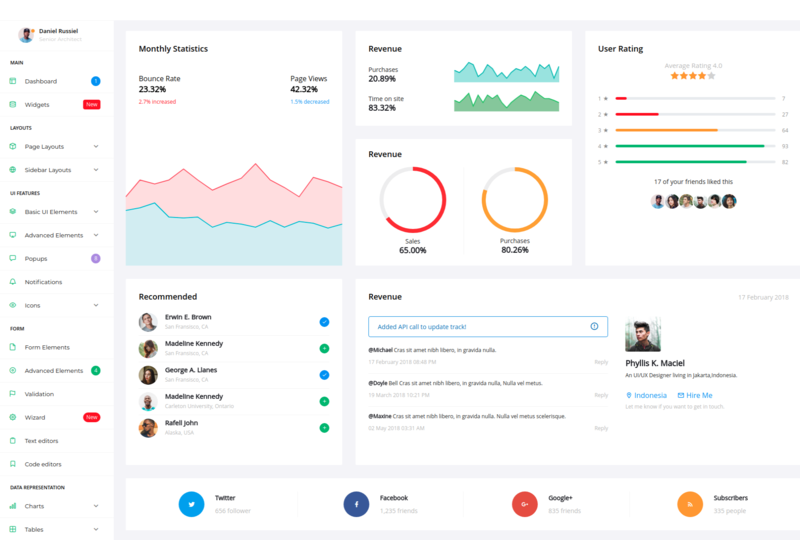 A responsive admin dashboard with material design, 6 layouts, 2 dashboards, and 8 color styles. The template has a neat design, with carefully arranged components that give the template an approachable look and feel. Peak Admin Template provides a lot of widgets and 100+ custom-made reusable components so that you can save hours of time when starting your web application. Within the 100+ pages, you will find anything that you need in this template. There are 1500+ font icons comprising of Font Awesome, Flags, Material Design, and Weather Icons. The template also consists of Summernote and Markdown editors along with all the other elements – forms, charts, maps, pre-built extra pages, and other UI components. This responsive admin template is built upon Angular 2, Material 2 and Bootstrap 4. The admin template as mentioned has the material design for its user interface. Lokra comes in two version – light and dark themed. The sidebar can be made fixed or collapsible using a toggle button. You can have five different layouts for the template which are flex, tabs, edges, cards and fullscreen. You have a dashboard example using edge layout. Lokra has many UI components, a good amount of widgets, a lot of pages and good functionalities that are necessary for an admin template to help kick start with your project. One of the main characteristics of the template is the widgets that are well-defined and the large typography of the template. This makes the interface very easy to use and user-friendly. The template is well documented on ThemeForest and costs $30 for the regular license. The template does not currently provide support. The admin template has an average rating of 4.43 stars out of 5 based on 7 ratings. Admin.io is built specifically for AngularJS. 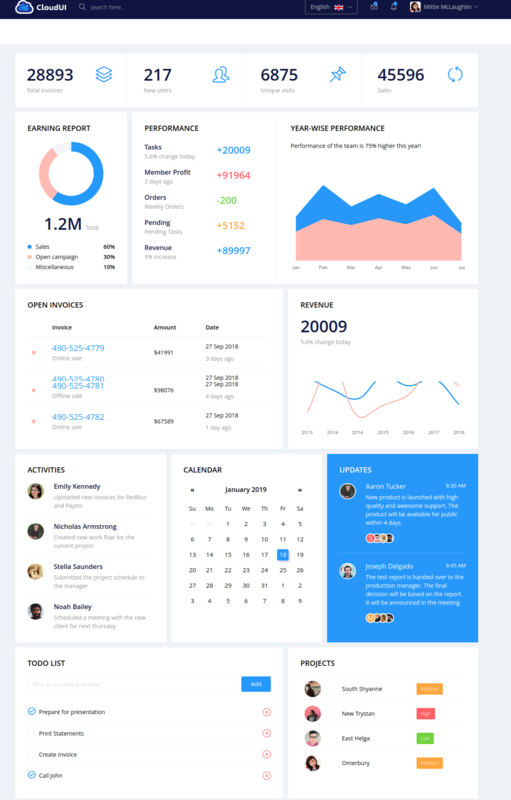 This is a fully responsive admin template with Google’s material design. It is a very easily customizable template with good quality code that helps you save time with any project using Angular. The template is not stuffed with too many components and plugins, but just enough to create a fully functional admin template, making it really simple and lightweight. Admin.io is well documented, easily customizable and supports all major web browsers. The support for this template is provided via email. The template is a premium template. Material is an admin template based on Angular and Bootstrap 4. The template is a responsive template that is perfect to be viewed from any device. The template is a good fit for an angular project that needs to be up and running in no time. You can get started with building your template and don’t have to build anything from the ground up. The template has a clean and well-commented code that improves the ease of use and improves readability. Making the template very easy to work with and easy to customize. The template is a premium template with good documentation and with great support for any issue that may arise with the template. NG-App is based on Angular 4 and Bootstrap 4. To help you get started as quickly as possible, the template has a lot of reusable UI components. The template is fully responsive with a great design based on Google’s Material Desing guidelines. The template has multiple dashboards and multiple responsive layouts. The template incorporates many plugins for charts, tables, and maps. The template uses 7 charting libraries to help you create the visual representation of the data. NG-APP is a premium template with good support and is well-documented. Assist is built with Angular 4 and Bootstrap 4 to help you create a responsive admin template in no time. The template has a beautiful design with neatly and cleanly arranged template components. The template has a unique design not seen in any other template. The template uses a soft color palette and good use of white space makes the template very beautiful to look at. Assist is a very user-friendly template that is compatible with many external plugins and add-ons to improve the functionality of the admin panel. Most of the popular plugins work perfectly with the template. The template already has incorporated a lot of plugins so that you don’t have to go search for them and incorporate them with your admin panel. The template has a well-commented code, is well-documented, and provides great support.